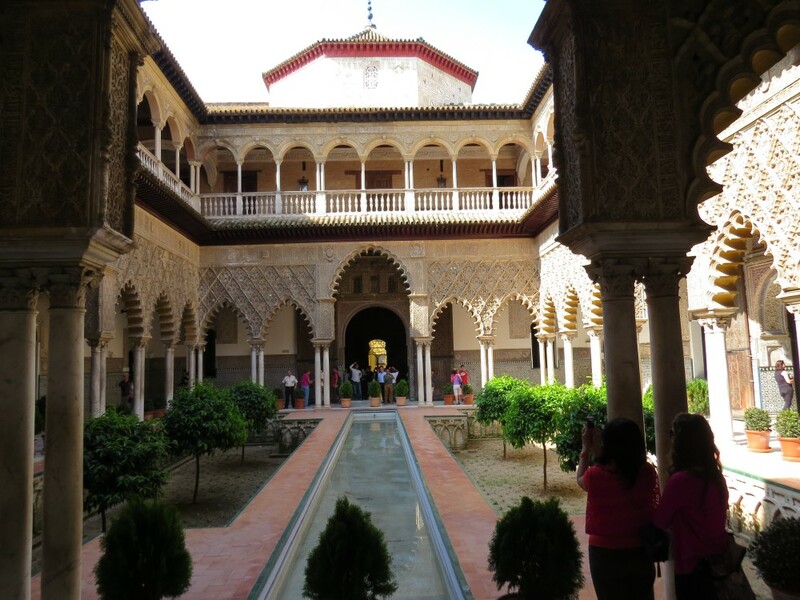 The Alcazar, Seville – That Exotic Fusion of Moorish and Christian Cultures. 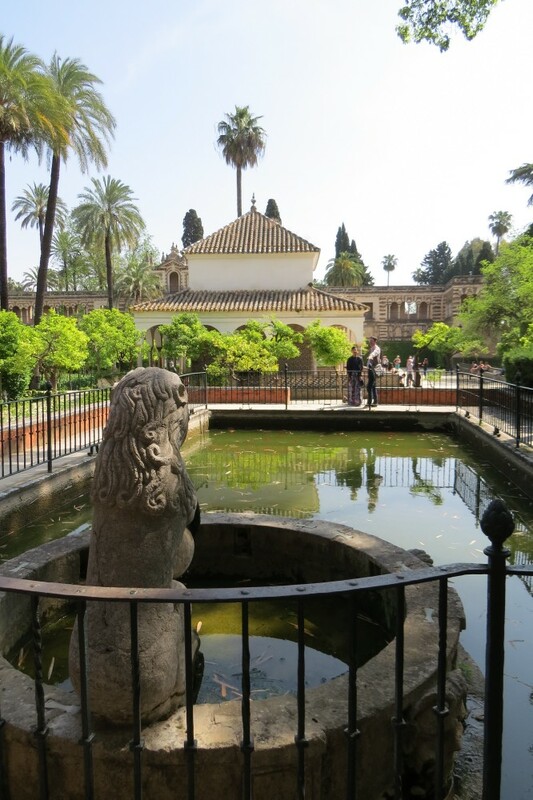 April is a wonderful time to visit Seville. In the two weeks after Easter, the weather has become more settled, the temperatures are in the comfortable upper 20s, the wisteria, judas trees and acacias are at their best, but also it is the ‘feria de abril de Sevilla’, when Seville puts on its party clothes. The young women are mostly dressed in bright flamboyant flamenco-style dresses, the men less keen to be seen in ‘traje corto’, short bolero jackets skin tight trousers and sombreros. It is a time to be seen and parades of horse-drawn open carriages slowly make their way along the main promenades to the bullring. In late evening, on the other side of the River Guadalquivir a blaze of light guides you to a large fiesta area, set aside for open-sided marquees and private parties dancing through to the morning. Although a party person, this was partying on a scale I couldn’t cope with……. 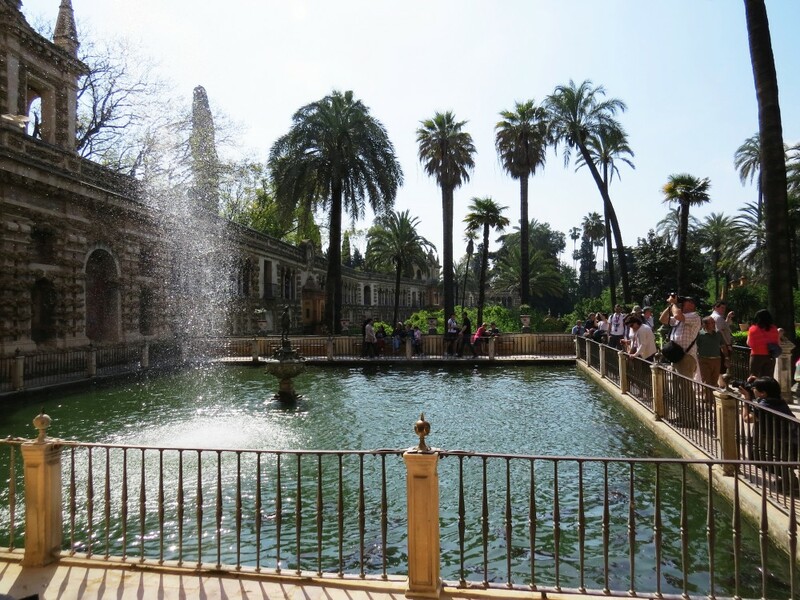 On my previous visit to Seville I briefly toured The Alcazar Palace, but this time had come back because I felt I hadn’t spent enough time in the gardens. The elegant palace dates from the 14th century, and is contemporary with the Moorish Nasrid palaces of The Alhambra in Granada. However Seville had been conquered by the Christian Spanish armies at this time, and its palace was built by mudejar (Moorish) craftsmen, fusing Muslim and Christian elements in a recognisably different style. Later Gothic, Renaissance and Baroque additions have altered and extended the palace, encroaching upon the internal courtyards. For example the spectacular Court of the Maidens is authentically 14th century mudejar at ground level, but the upper storey was added in the mid 16th century; although together I think they do make a pleasing if slightly odd composition. Unusually the five small walled rectangular gardens closest to the palace, laid out from the late 15th to late 16th century, still have the intimacy of Islamic paradise gardens. 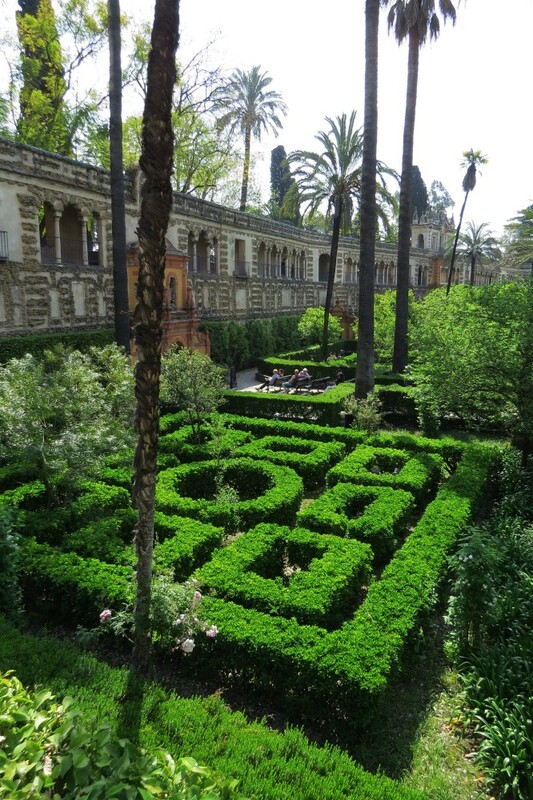 Seats are shaded by evergreen magnolias and fan palms and the gardens are planted with lemons, jasmine and myrtle; climbing roses, wisteria, acanthus and box. Unusual espalier wall-trained bitter Seville oranges perfume the air. The peaceful sound of water gently splashing in the fountain bowls at the centre of each garden completes this delight for the senses. 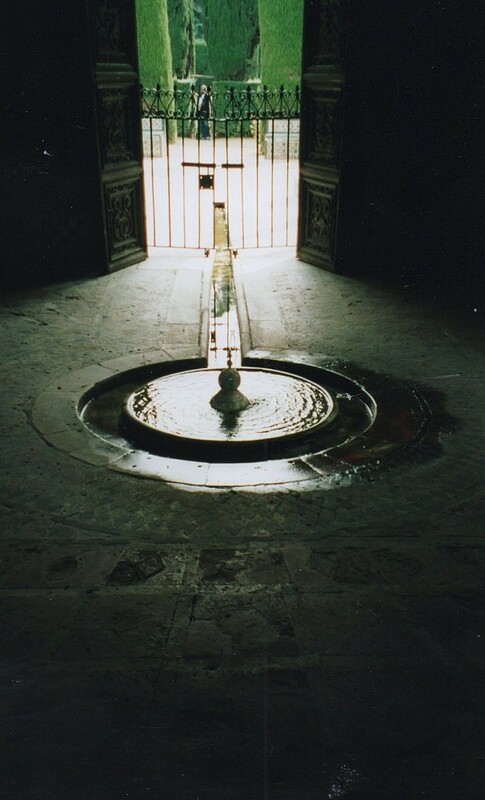 The Garden of the Mercury Pond, named after its bronze statue is clearly a Renaissance addition, where water crashes some eight metres from a spout on an upper storey of the palace into the Roman water storage basin below. Along one side, the high 12th century fortress walls were partially rebuilt as a raised covered promenade walk, with elegant Renaissance arched openings overlooking the Ladies Garden. The 16 hectare (40 acre) garden was largely productive at this time, and there is little recorded garden detail from the period, but royal pavilions were set amongst pigsties in lemon, orange and pomegranate orchards, away from the bustle and intrigue of the court. These garden areas are largely ignored by the visitors, and I was relieved to escape the crowds. My favourite area, The Abode Garden, was originally an orchard with a mudejar-styled royal pavilion, enclosing a low central fountain bowl and rill. 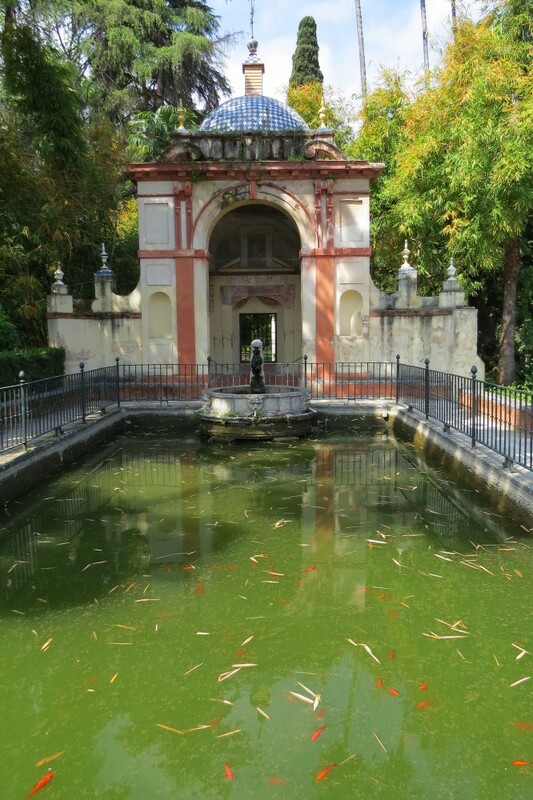 It was refurbished for Charles V in the 1540s, and a century later the adjacent Lion Summerhouse was built in a flamboyant classical style, with a domed blue and white tiled arabesque roof overlooking a small raised pond. The remaining garden areas within the high palace walls cover 30 of the 40 acres and are mostly of early 20th century origin, but I found it difficult to get excited about the so-called English Garden, the largely productive Retreat of the Marquis Garden, or the quirky and slightly surreal Maze Garden, with its shoulder-height hedges of myrtle, and projecting tall cylinders of cypress; which should be points of reference, but actually add to the confusion. 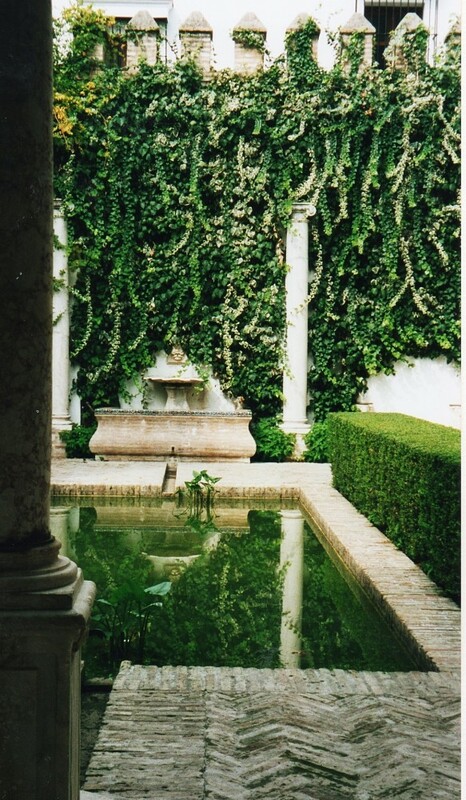 It is remarkable that the gardens of the Alcazar, have survived at all, but this wonderfully unique fusion of cultures has enchanted successive generations, and the perceptible ghost of the Islamic paradise garden is to be found in the layout, the calming sound of water and the exquisitely scented air.